Lucy Mae Tharp, 98, of Farmer City, Illinois, passed away at 5:05 A.M., Wednesday, December 20, 2017, at the Farmer City Rehab & Health Care Center. Her funeral service will be 3:00 P.M., Saturday, December 23, 2017, at Calvert-Belangee-Bruce Funeral Home, Farmer City, Illinois, with Bud McMasters officiating. Visitation will be 1:00 P.M. – 3:00 P.M., Saturday, December 23, 2017, at the funeral home. Burial will be in Maple Grove Cemetery, Farmer City, Illinois. Lucy was born October 19, 1919, in Noble, Illinois, a daughter of Irene Farleigh and Wesley Ratcliffe. She married Charles Francis Tharp Sr. on October 27, 1945, in Farmer City, Illinois. He passed away May 24, 2008. She is survived by her sons, Donald (Joan) Corder of Lemoore, California, Charles F. Tharp Jr. of Farmer City, Illinois and Robert L. (Janet) Tharp of Farmer City, Illinois; daughter-in-law, Louise Corder of Jacksonville, Illinois; seven grandchildren; eight great-grandchildren; one great-great-grandson; four stepgrandchildren; sister, Betty (Glenn) Smith of Bloomingdale, Georgia. She was preceded in death by her husband; parents; son, John Corder; sisters, Josephine Ratcliffe and Betty Smith; brothers, James, Robert and Roy Ratcliffe. 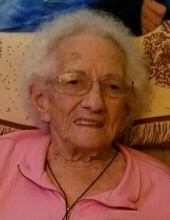 Lucy was a member of the First Christian Church, Farmer City, Illinois, past president and a 70-year member of the Joe Williams American Legion Auxiliary, Unit 55, Farmer City, Illinois, Fred G. O’Malley V.F.W. Auxiliary Unit 6190, Farmer City, Illinois and served on the DeWitt County Election Board for many years.